An entire civilisation has come and gone. The plague took it all. The rich, the poor, the soldiers, the traders… no, not the traders. They always strive whatever the circumstances, and you are here to put them back in business with your trusted nail. 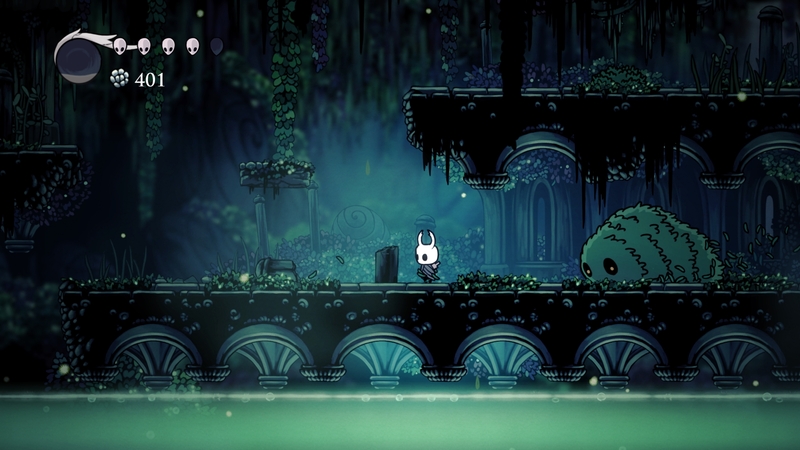 Hollow Knight by Team Cherry is an action platformer belonging to the Metroidvania genre, games modelled after Super Metroid and Castlevania: Symphony of The Night in which the game world is a huge interconnected area with some sections only accessible once a specific power has been obtained. This genre is very appreciated by many, as improving the hero becomes very satisfying both in terms of combat and navigation. Rather than going through the levels and forgetting them, in Metroidvanias the player often has to go back through certain points and become very familiar with the layout of the world, effectively making it their own. Despite their popularity, Metroidvanias are quite rare. Good Metroidvanias are even more rare, so there is a huge demand for one. 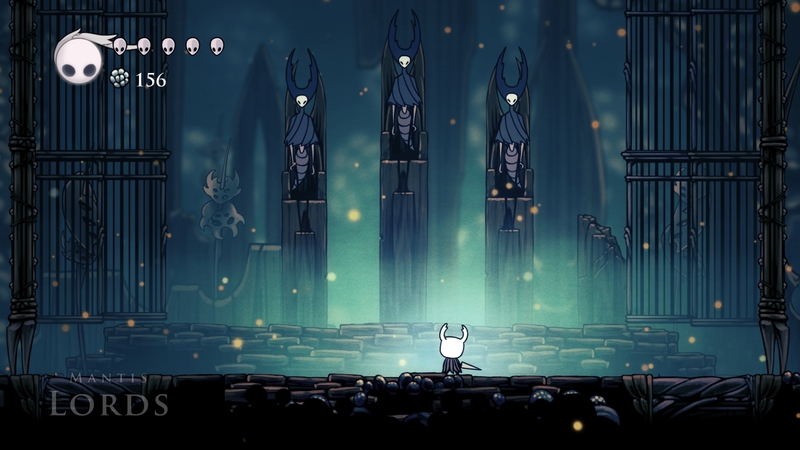 Let’s see if Hollow Knight is one of them. Looking at screenshots immediately reminds me of Castlevania. Some sort of knight in some sort of gothic environment with some sort of melee weapon. 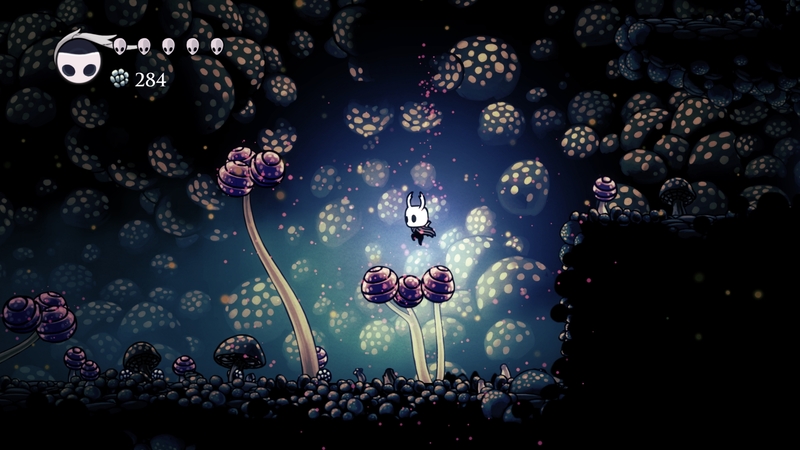 On top of that, Hollow Knight has its own original feel with gorgeous drawn art for the background and fluidly animated insect-type monsters or knights as enemies. No wonder the Kickstarter was so successful; a game close to Castlevania with a spin on the art style, what a dream! The monsters are geared towards cute and cartoonish and rather anthropomorphic, so that they only rarely evoke the disgust that insects usually inflict. Except for a very few enemies, everything is more beautiful and elegant than creepy and nasty. The backgrounds are oozing with a sense of gigantism and mystery, inviting us into this deep world of dark tunnels, infested caves and derelict cities. However… I rarely felt the need to press my button dedicated to screenshots. Everything is very nice, but a “wow” factor was sorely missed. 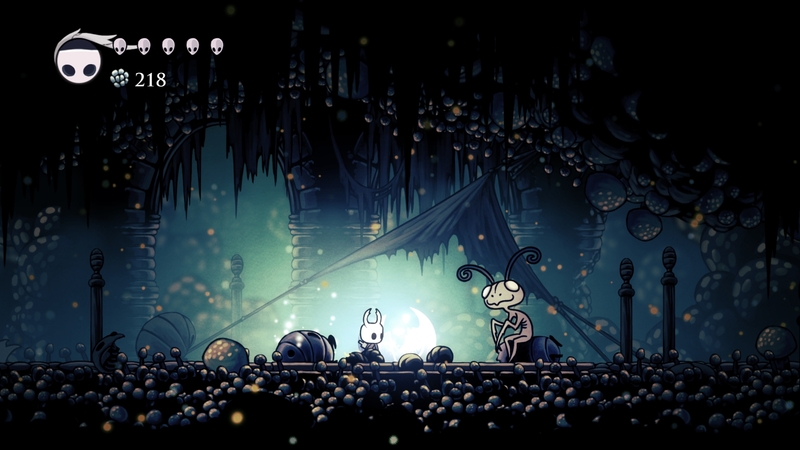 Hollow Knight works in subtlety rather than flashy demonstrations. Since we are talking about the visuals, the framerate can be fully unlocked and the game is super smooth. However, there are occasional micro-freezes in certain areas (especially when splashing around in water) and most of the negative reviews on launch were due to this annoyance. Maybe some players encounter a very high frequency of those freezes, on my end it was manageable but sometimes quite infuriating if it happened during a tough fight and I died because of that. The music enhances the atmosphere really well, epic, weird or melancholic when needed. What impressed me most was the attention to sound design, with occasional resonating noises and more importantly with the foreboding sound that a few monsters made. You can hear them scuttling somewhere around you, rattling their legs on the rocks, letting you know that something is lurking in the dark. This was one of the (many) brilliant aspects of the original Doom, and I always appreciate seeing sound designed used to great extent in other games. Game mechanics take a long time to be acquired, but eventually comprise the full spectrum of good platformer moves with dash, double jump, wall jump and so on. At first, navigating through the huge sprawling levels is a tedious bore but later on it gets a bit more fun. The part that is consistently fun though is the tough combat. Borrowing from Shovel Knight, attacking from above is a very useful move to dispatch some very fierce opponents that can guard, dash, jump, roll and explode. The bestiary is well furnished and can sometimes trigger some very challenging fights. Learning the movement and attack patterns of the enemy creatures and bosses is a real pleasure, and I have rarely seen a game in which attacks are telegraphed so well. You can always see when an enemy is getting ready to strike and you have just enough time to react. Even the hitboxes are perfectly crafted and being hit never feels unfair. Truly the combat is the highlight of this game besides its unique identity. What impressed me far less was the level design. Apart from a few areas that make full use of the wall-jumping ability (actually the whole Mantis village and boss fight are spectacular), most of the rest of the game is not very interesting. Under certain circumstances, I would be fine with that. After all, the Castlevania games are mainly composed of simple rooms and basic platforms. 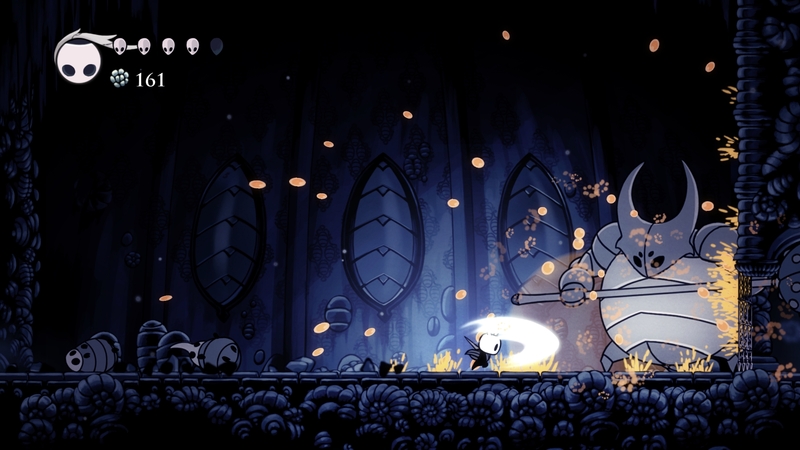 However, their layout is very intuitive and easy to follow while Hollow Knight is a sprawling mess of twists and turns and dead ends that are excessively confusing. Even more confusing is the forced absence of a minimap. Don’t take me wrong, there is a minimap, however it needs to be found for each area and, even then, it remains incomplete and has to be manually filled by the main character upon reaching a save-point. You can even read the words “The map has been updated” when you don’t have a map to update, adding insult to injury. Why can’t my character even chart the map of a new area himself if he already fills in the gaps of another area? This system is absolutely horrendous, as it completely put me off exploring new areas in fear of getting lost or missing huge chunks of the world because I took a right turn instead of a left, and later on I can’t find my way back there or I even forget where it was. Each time I ventured into a new place, I crossed my fingers to find the map very quickly. I can understand the pleasure of exploring an uncharted territory without guidance or aid that some people have, but then at least let me map automatically any area I visited when I reach a save-point. Or better, do it just like every single other Metroidvania and let the map be filled automatically when I progress through the levels. I hope I will never see this again in future games. Same for the equipment, I want to switch it around whenever I want and not be bound to the very rare save-points in order to access my inventory. Yes, the save-points are very rare. 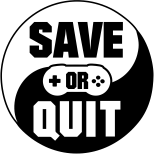 Well the progress is permanently saved at all times, but the rare save-points serve as respawn locations, and along with the fast-travel points they are very far and spaced in the levels. This was also a huge source of discomfort for me, as the game kept forcing me to travel long distances for no good reason. Let me enlighten you with an example of how rage-inducing this whole mess is. I died at point A, let’s call it San Francisco. I respawn in New York, because that’s how far the distances in this game are. There is an annoying game mechanic also borrowed from Shovel Knight in which you lose your money upon death and need to retrieve it before you die again, so I go to San Francisco and get my loot back (except if I die again to the very strong monsters that killed me while battling over noxious acid). Well before venturing from San Francisco to a new location called Los Angeles, I need to go back to a merchant in Paris and repair an equipment item that broke when I died. So I go to Mexico city because that’s where the fast-travel is, and it brings me to London. I then swim to Paris and repair my item. I probably have too much loot to risk losing it upon death, so I decide to store it in the bank. I travel to Berlin where the banker is, then back to London, back to Mexico city, and finally I head back to San Francisco so I can resume my route to Los Angeles. In case you didn’t get my point, I will use the dreaded caps lock. I HATE THIS, STOP WASTING MY TIME. 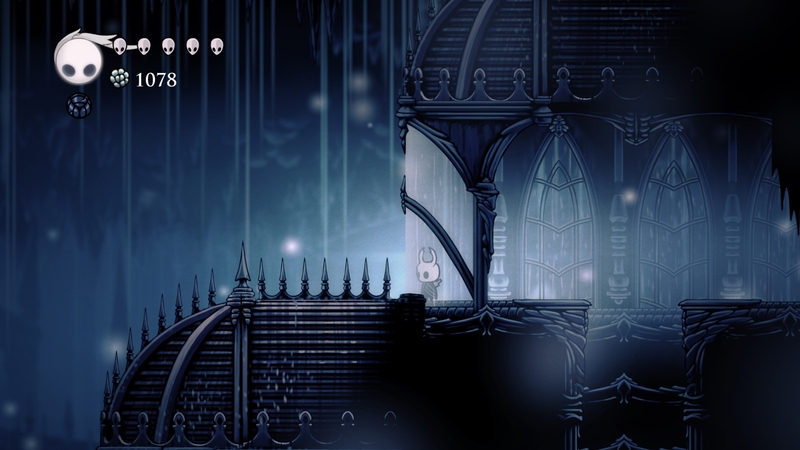 Hollow Knight often felt like it was completely disrespectful to how precious my time is in order to increase its length in a tasteless and obnoxious way. Finishing the game can take dozens of hours, so if you judge games by how long they last then I HOPE THAT YOU ARE SATISFIED THIS GAME IS PURE GOLD AND SHEER JOY. Kill me. There are tons of things to buy from the game’s shopkeepers, and they are all scattered all over the place rather than nicely available in one single place next to a fast-travel point. Let me tell you something, my favorite Castlevania game is Portrait of Ruin on Nintendo DS. While it doesn’t have the epic scale of Symphony of The Night, it has the most elegant level design that this series has ever seen. Each save-point is located next to a fast-travel teleporter, and there are a lot of them. There is always one before entering a new area. In the middle of a level. Right before a boss room. Simple and effective. 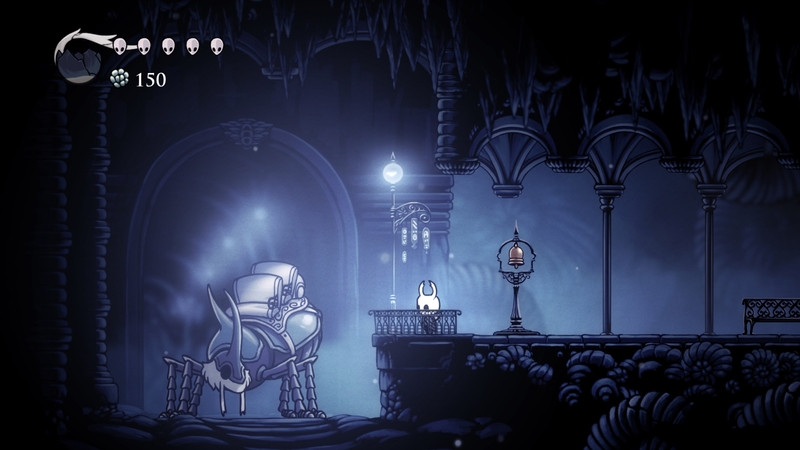 Talking of boss rooms, in Hollow Knight they can spring on you with little warning which is even more annoying when you have an inventory item that can break upon death. I can actually see the thrill of that, since I once encountered a boss for the first time while fearing for my items and it was super tense. I managed to kill it in one go and loved it. However, those two minutes of fun won’t give me back the hours wasted in backtracking. There is so much backtracking in this game. I already described how the points of interest are very far from each other, and add to that some specific locations that require a power to be bypassed are hidden here and there without being charted on the map when you see them. You get a new power? Explore again each old area to see which one has a passage that you can open. Because yes, since the game is decidedly acing it in the art of wasting your time, the world is huge and sprawling in every direction without telling you where you should actually go next. You can explore an entire area before realizing that there is nothing for you there for the moment, it’s just another dead end. Similarly, the story enjoys being cryptic, so I have absolutely no idea who my character is nor what he is doing here. In general I don’t mind the stories much, but here I would have sometimes needed at least a little bit of motivation to convince me to keep going. Hollow Knight is mysterious and intriguing, subtle and cute. One of the best Metroidvanias in terms of combat, one of the worst in terms of level design. There is so much to see, and yet it feels boring and tedious. The fast-travel, save-points and merchants are distributed in the most distant and impractical ways, so that for each few minutes of something good you have bitter hours wasted in a very dull and repetitive way. And yet there is very little reward for all your efforts, as the game drags on and on without ever truly impressing. Much more condensed, with better positioning of the fast-travel and with a classical mini-map I would have loved it, but as it is only those that want to collect all the trinkets while getting lost exploring a huge sad, hollow world will truly love this game to bits. Glad to find this review. I have nearly the exact critiques of the game and it was driving me crazy that almost all I can find online are people gushing about it. Another thing that blows my mind is hearing people say it dethroned Super Metroid as their favorite game. Makes me wonder if they were paying attention to all the things Super Metroid did right. Hmmm….the sad and desolate world is kinda the point. The game just got ANOTHER FREE DLC. The story is incredibly interperative and vague yet thoroughly intricate and enjoyable at the same time. Some of the world design may have went a little bit overboard, in sheer size. But I can’t fault a small indie team for having too much ambition and scope. Super Metroid is the defining moment for the genre. However, its been built upon and continues to be ever since. I think a few games of the genre are on par with it. This, of course, being one of them. It is hard to put nostalgia aside. Yet, its mandatory and inevitable if we’re going to fully appreciate and unbiasedly critique their contemporaries.